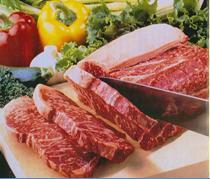 All the meat we supply are certified "Brunei Halal". We import Beef and Sheep meat through Halaqah Sdn Bhd, processed chicken products like nuggets, are imported through Comantra Sdn Bhd, while the rest of the meat are bought locally, meeting halal regulations. We have a range of beef grades, from high end Wagyu beef to Prime Steer. Chicken from local farms, and frozen duck from Malaysian farms. All Halal.